Last week I wrote about how the impact of speed on our transit networks. I showed that just because one vehicle might have a higher top speed than another on paper, that it doesn’t necessarily mean it will be much faster in reality. A lot depends on aspects like acceleration and station spacing, for example, over 2km there is just a four second difference between one of our trains with a maximum speed of 110km/h over one with a maximum of 90km/h. To come up with that result I created a model that uses the acceleration and braking profile of our trains to estimate how long travel would take between stations, based on the distance and the maximum speed allowed. I originally built it to look the various travel time options that will be available for trips to the airport, to test just how accurate the claims were by Auckland Transport of light rail, that many have questioned. I was also inspired by Transport Minister Phil Twyford’s comments at the launch of the Manukau Bus Station where talked about the network that will be built. We’re going to build rapid transit network, starting with light rail from the city and across the isthmus and out though Mangere. It’s going to deliver 21st century rapid transit to a swathe of our city, and it will stimulate a massive surge of private sector investment in urban renewal that will create more affordable housing and a better built environment for so many of our people. Alongside that immediate priority, we’re going to run rapid bus services connecting the airport, Puhinui and Manukau, giving everybody who’s served by the heavy rail network right across our city, rapid transit access to the airport and all the jobs out here in South Auckland. That airport to Puhinui link will be the first step in a rapid transit link serving the south east, which is even worse than my beloved West Auckland when it comes to being served by public transport. So when you put those, the light rail, the south east rapid transit line alongside extension of the Northern Busway, electric rail to Pukekohe, you have the trunk architecture of a rapid transit system, and around that, you put the high frequency bus services, and ferries to support that rapid transit. Within a generation folks, we’re going to deliver Auckland a world class public transport system. In this post I look at those airport options. It takes the modelling in the last post a step further by adding in multiplier factor to account for the fact that conditions aren’t always perfect, that there are hills and curves which may not be able to be negotiated at the top speed, and included dwell times at stations. So travel time + multiplier + dwell time. Before getting into the airport comparisons, I first wanted to calibrate the model against our existing rail network. I plugged in the distances between each station, what I understand the maximum line speeds to be – although around the approach to Britomart to reflect the approach to Britomart being slower. For the dwell times I’ve used 50 seconds as an average dwell time based on my personal observations, with the exception of Newmarket for the Western Line. 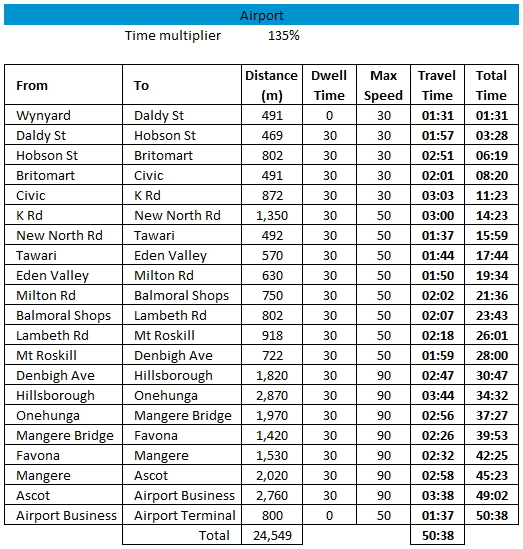 I then adjusted the multiplier to get the times similar to what the Auckland Transport timetable says. For this the Western Line is slightly higher which is understandable due to the extra hills, curves and level crossings. The next step was to think about what the trains should be capable of after the CRL has been completed, and assuming Auckland Transport manage to speed up trains, both through dwell time and other network improvements. For most stations the dwell time drops to 30 seconds with slightly longer allowed at larger stations. The travel times are also to Aotea given it will be the heart of the network. Of course, the Western Line is the big beneficiary here with travel times dropping substantially. For example, New Lynn would be around 21 minutes from Aotea while Henderson is about 33 minutes. Those times start to become competitive with driving at most times of the day once you factor in things like parking. You may also notice those times are slightly faster than City Rail Link advertise, but given how conservative their comms have been over the level of improvement that project will deliver, that’s not surprising. As mentioned, looking at the travel times to the airport was a key reason for building the model. 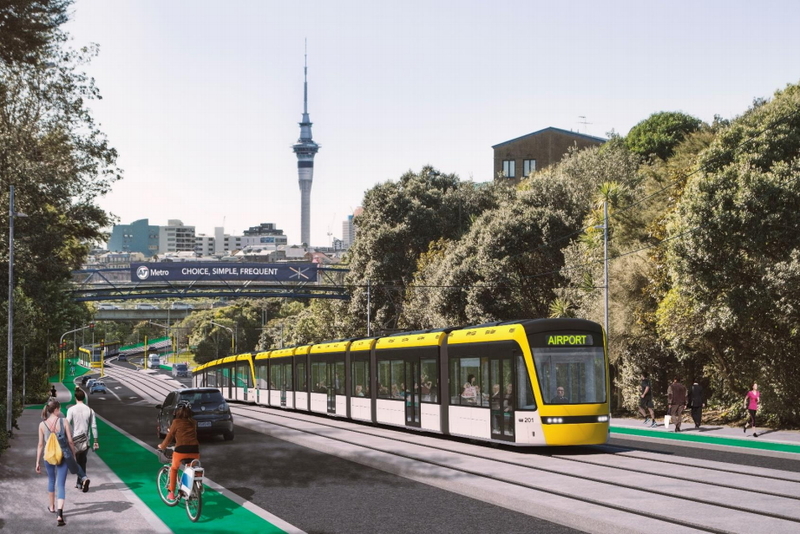 Auckland Transport have claimed that light rail should be able to reach the airport from the city in 45 minutes and much of the opposition to it questioned this, focusing on the fact that on Dominion Rd the speed limit is 50km/h. They also miss that in the city centre on Queen St, the speed limit is just 30km/h. But to quote an old sporting cliche, light rail is a route of two halves. Once it reaches SH20, the station spacing opens up and so would the speed limits. So, I plugged all of that into the same model as above and the results were surprising. 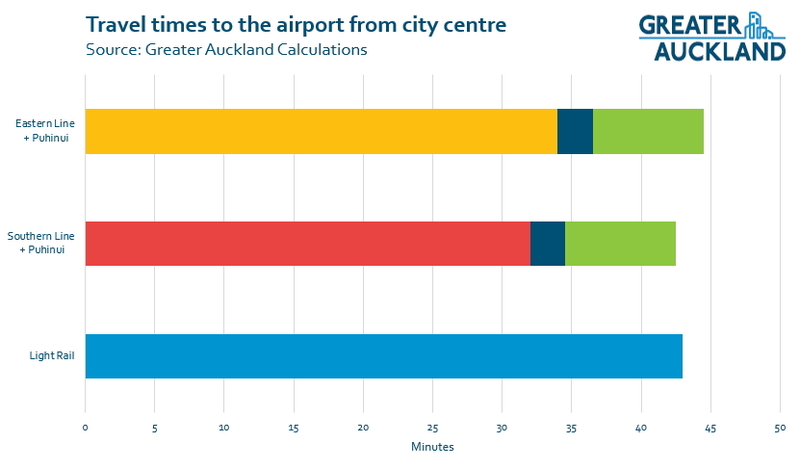 Even with the slower speed along Dominion Rd and the more frequent stations, the calculations show that boarding light rail in the middle of the city, it should be possible to get to the Airport in just over 42 minutes. In other words, ATs estimation is correct. What’s more, it’s quite common for light rail to have better acceleration and braking than heavy rail, for example CAFs Urbos 3 and Alstrom’s Citadis X05 are both capable of acceleration of 1.3m/s². The very first rapid transit to the airport is going to be via a bus connection to an upgraded Puhinui Station, and eventually a full busway. But even if it was built as heavy rail, and you didn’t have all the other issues associated with it, how long would it take? From Puhinui it’s around 6.7km to the airport and I’ve assumed a stop at the Airport business district. This results in a travel time of 8 minutes. When combined with the travel time to Puhinui it means a total time of around 41 minutes – with the bus option there’ll be a short transfer time too. In other words, when you actually plug all the numbers in, travel times are about the same regardless of mode. One of the reasons for that is while heavy rail can travel faster and has fewer stops, it also has to travel a longer. For example, it’s almost 30km from Britomart to the airport via Puhinui compared with just 22km for the proposed light rail route. One of the most fascinating outcomes for me from this is that there’s no clear winner. Even though light rail isn’t really about serving air travellers, from the centre of the city all options take about the same length of time. The fastest way to get to the airport will be to hop on whatever train, light or heavy, is closest to you. If you do catch a heavy rail train, then a simple transfer at Puhinui to a high-quality bus will reliably whisk you the remainder of your journey. I think this is quite a good outcome, after all we’re trying to build a PT network that is useful to a lot of people, not just one that provides an express service to one location. Longer term, there may be a couple of other options that people could use. In particular, future regional services might only stop at one or two stations within the Auckland Network and Puhinui is likely to be one of them given it will provide for connections to the airport. That could also be used to provide a faster, but likely more expensive, service to/from the city via Puhinui. The next step is to apply this model to other parts of the proposed Rapid Transit Network. What do you make of the travel times? The dark blue on your graph is the waiting time at the station, right? That’s the true test of patience for a tourist – it is one thing to wait for a bus or train at a main station, where you are pretty sure there will be a good service soon – but is another thing to be dropped off in the deserted tumbleweed realms of Puhinui and wait there with few other people around. I’d do it, but I doubt many people will once the direct LR route opens. On the other hand, if the Puhinui transfer station and bus service is done right, it’ll resemble a kind of airport shuttle.. all congestion-free and predictable, and with room for luggage. Sounds like a better plan CBD-to-airport, especially with limited stop trains. But there will soon be a brand new all weather secure interchange station at Puhinui for this very purpose. I think the idea is that Puhinui would be more like Panmure than it’s current tumbleweed status. Trains underneath and buses on top with good signage and good shelter. If you add some dark blue at the start of the journey (the average wait time for a train assuming turn up and go), I think light rail will end up quicker. I wish AT would include this fact in their comparison. I think 30 seconds dwell time is quite high for light rail especially on the lesser stops. Do Melbourne trams dwell that long? Conversely I think you assumed no other stoppages for traffic lights etc. Even with priority this seems unlikely. The usual wait for modelling is half the headway between trains. Some people turn up just as a train appears and have no wait, some turn up as one leaves and wait the entire headway. The mean wait is half that. What? No stops between Britomart and the Civic? That’s no use to me. Or are the CityLink buses going to keep going? Remember at least lower Queen st will be a pedestrian mall so a lot more walkable. It won’t be like the battle at present to walk up through crowded ped areas and waiting at traffic lights. According to Google Maps, it’s a 13 minute walk from Britomart to the Civc Theatre. So that’s a maximum walk of 6.5 mins between those 2 stops. Also an additional 6.5 minutes could easily be the difference that makes the car the best choice for people. No stops between civic and K Road too which is quite a hill. Maybe not much catchment there though. Yes regarding the steeper section I do like the idea of another station in between, right across form Myers Park as it’s pretty steep for a lot of people. This would give catchment for people from Greys Ave through the park & also from Symonds St down City Rd. The alternative is drop the single Civic station and split the distance into two stations, but think that is less than ideal for placement. Flip the original May 2015 study had 6 stops (including one right across from Britomart as it was going to go along Fanshawe St), but that sure is too many. Sorry, we’re not spending several billion dollars to end up with a snail stopping every minute to cater for the tiny numbers who can’t manage a 6 minute walk. Maybe they can provide an electric tricycle service for those who find the 3 stops on Queen St inconvenient. ~53,000 people live in the city center and need access to transit too…. dr – They will get two stops 491m apart, I think they will pretty well served. 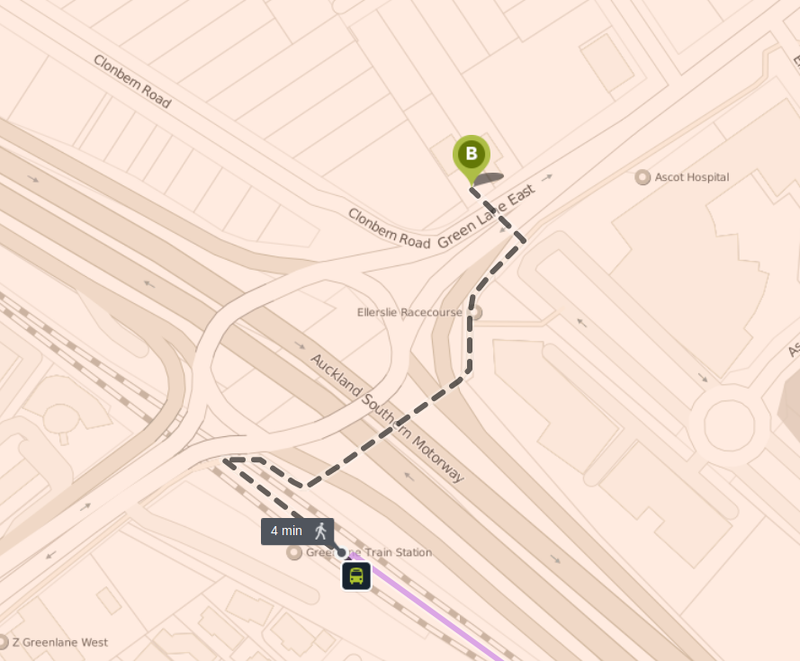 @Jezza The stop distance according to Matt’s chart is 872 between Civic & K’Rd & this is the steepest section. The distance between the 2nd & 3rd stops looks to be swapped – Hobson to Brit West is more like 469. Actually less more like 750m, 9-10 minutes I would think as the LRT station will be not where Britomart is as the line is proposed along Custom St then turns up Queen St. I’m thinking the stop would be slightly up Queen St but maybe down from the current City Link bus stop at 44 Queen St. Won’t be like getting all the way inside of Britomart actually to the platforms as per a lot of HR station stops where you have to walk quite a bit to get actually to it. Yet another advantage of LRT over HR. 13 minutes to walk 700m?! That’s about 3km/h… a very slow walk, someone on crutches would go that slow. A typical adult would walk almost double that speed. I expect the Google Maps time includes 8 minutes of walking and 5 minutes of waiting for the pedestrian crossing lights – so that won’t apply to a pedestrianised Queen St. Surely we want the back of the train to have cleared the previous station before the front of the train arrives at the next. 700m seems like the smallest gap between stops that makes any sense. Google actually shows 13 minutes to walk 1 km, via Albert St. It shows 11 minutes for walking 850m down Queen St. Using the Wikipedia average walking speed of 5 km/hr, this distance would take 10 minutes and 12 seconds. So 11 minutes doesn’t put in much time for waiting at lights, perhaps appropriate for the pedestrianised Queen St.
For me, these stops are sufficient if they connect to the other routes, which they will. But yes, electric trishaws like they’re using at old folks’ homes would be fantastic for people who can’t manage it. Still think the steeper section of Queen St is going to be a long walk effectively if the Civic Station means outside the Civic & you need to cross Mayoral Drive which may be taking all the cross general vehicular traffic, plus K’Rd one will be down stairs or ramp or something. Also will this upper section of Queen St be pedestrianised like the lower section? I know it’s a bit too close as far as a LRT station goes but this is a slightly exceptional case. Would an 80 year old walk up ~400m here easily? On a related note it makes me think if the LRT units are going to be 66m long, be interesting door access in the trenched tunnel under K’Rd with that length – have to be quite a long trench… and what if 99m was needed in the future? It’s interesting to see much of the commentary in the media is about getting people from the airport to the CBD or vice versa. What about the travelers heading to the airport from other parts of Auckland, or going to other parts of Auckland? I’m all for light rail to the airport, but the Puhinui link in addition will mean that other’s not served by light rail, such as those along the Southern Line, in places like Manurewa, Papakura, and even Pukekohe, will have access to public transport to the airport. To me it seems like having both options will create some great network connections! For argument sake, would light rail from Manukau via Puhinui be faster than the bus option? The frequency and wait time notwithstanding, it depends on the priority. If you give both fully dedicated lanes and signal priority, they’d both be equally quick. However in practice it’s easier to compromise priority with buses, but also easier to deliver better frequencies. It’s a BRT so probably same time. The problem is capacity. LRT can carry more people. The conflict then is commuters vs travellers. Travellers will probably not be happy if the buses are full of commuters and there is no where for their bags. And vice versa. If comparing a future LRT to the current bus then yes it will be faster, however, that’s simply because any future light rail service will be congestion free and will have signal priority. Bus links are rarely built to that standard of separation and are hence generally slower. The Northern Express demonstrates (at least in part) that this can also be achieved with buses. What about some totally different frequent system to connect the Airport with Puhinui? Have people movers, cable cars etc. etc. been investigated? At 7km it’s a bit long for those sorts of things, and given there is currently almost nothing in between there is no reason not to use a cheap and effective ground level solution. Then what about camel trains, Bedouin caravan, walking bus, giant travelator, musky hyperloop? Anything but the obvious proven modes! Your Southern timings are a bit long. On Sunday night we did Manurewa- Britomart in 38 minutes (timetable is 42 minutes). Your 50 second dwell times are, in my experience, too high and a lot of train managers have been getting them down to 40-45 seconds. Although my train travel is reducing preparatory to my retirement, I have noticed in the last few days that the drivers are driving slower to stay within timetable which shows that there is far too much slack in the system. A caveat here: I travel counter direction as I work nights. I timed most of the stops on a Saturday morning train from Manukau to Britomart. Most of them were around 42 seconds with a best of 38 and a worst of 52. Getting better but still too much time wasted getting going after the doors close. I timed 3 of my 6 stops this morning – quickest was 40 seconds at TeMahia, worst at Homai – 55 seconds. It’d be interesting to see the catchment area that’s currently within an hour’s travel to the airport by PT and how that area will improve after light rail and CRL are completed. Or within an hour’s travel to the CBD. Those are much more complicated modeling exercises though, has AT done anything like this? What I found interesting was the parallels between late-19th century Boston and early-21st century Auckland. Streets heavily congested by last-century transport modes, very high public transport ridership (and growing) and land use limited by lack of transport access. A lot of the political arguments sounded similar too. A detail, but Boston (1897) was the first electrified underground railway in America, not in the world – London (1890) and Budapest (1896) beat Boston to it. Ah yes my mistake. Thanks for pointing that out! So where is the Western Line users supposed to join the light rail service, K’rd ? easy trf like at Puhinui ? Interesting and valuable analysis. It’s reassuring that your calculations and those put forward by AT are relatively in sync. The idea promoted by the HR-to-the-Airport standouts that the speed difference has been grossly underestimated by AT appears to be based on nothing more than, well, instinct and a distrust of anything that AT says, rather than any real evidence. I’d be interested in their critique of your work, and any alternative analysis they may have of a similar nature. Maybe we can then put this issue to bed . . . ? But even though the HR journey from the Airport to the city may be a couple of minutes longer than the light rail journey, the largest question for me is “Does it really matter?”. Will a commuter from the central city to the airport eschew light rail because it takes two or three minutes longer than an HR alternative which was not proceeded with? As a rail commuter myself, it would make no difference whatsoever to my decision making. Will a tourist arriving at Auckland after a 12- or 24-hour flight trash the city’s reputation because the light rail offering to the CBD lost them two or three minutes of their valuable time? As a regular overseas traveller who has used PT to get from airports to city centres around the world, my response is that I’m mostly just glad to have arrived, and the idea that 2-3 minutes time saving might be the difference between satisfaction and anger at the stupid PT strategists is just laughable. As I suspect it is for 99% of the travelling pubic. If it does matter so much, then these time-poor travellers are welcome to use a taxi to get to their destination – as they do now and as countless people across the globe do for accessing the airport. Not that there’s a guarantee that a taxi will be any quicker than light rail in peak conditions. And all the chatter about how “real” airports have invested in heavy rail obscures the reality that Auckland Airport, though hugely significant to NZ, is very much a secondary airport in global terms. And the reality that every city has very specific conditions which militate against some transit options and in favour of others. In Auckland’s case, one of the most import local conditions is the need to create a rapid transit NETWORK from close to nothing; the HR options being clung to by some do little to advance that objective. So congratulations on a sterling piece of work that explodes at least one of the myths promoted by the HR lobby. I look forward to their alternative analysis, and their reasoning as to why these two or three minutes are so vital that it’s worth spending gazillions more to make such savings. Worse, Journey Planner directs him to cross Green Lane Rd East near the roundabout: https://i.imgur.com/XvDi7Ob.png … Can I trust a 17-year-old not to do so sometimes if he’s running late? To me, worrying about a few minutes difference in HR and LR travel times between airport and CBD when real people using the system encounter danger, unconnected routes, footpaths that just end, and all manner of unwalkable infrastructure is taking the Mechanical Mindset to new levels of absurdity. Or how about this 6 minute walk to connect the southern line with the 007. https://i.imgur.com/COmoHmV.png These are intersecting routes on a network, AT!! Absolutely hopeless. Tell me why you’re spending 1.2 billion dollars on new and widened roads again? Fixing the city’s walkability is a far higher priority. Yes, AT is doing some bizarre things, like they’re giving us more PT but making it harder to use. Until last year, buses utilized the bus stop in Westgate shopping centre…convenient for those going there and to the new Westgate mall. Then, with the western restructure, that stop was abandoned and the 14t and 14w buses from Henderson stop on side streets hundreds of metres out of the shopping centre and even further from the new mall. I refuse to go there anymore because the walk is too far, and mostly uphill. Trouble with the shopping malls signs and right turns into the ctr IIRC. Can’t remember if AT just being weak about it or not. Google it if want more info. Yes depressing stupid rule book or political things screwing good design up all the time. It most resembles a circuit board. https://www.google.com/maps/@-36.8217611,174.6166713,359a,35y,296.56h,44.87t/data=!3m1!1e3 … I guess there’s no reason AT would put a bus stop in the middle of a circuit board…? To be fair to AT. That stop and the route suggested is about the safest route you could take there if using the 007 given where the train station is. It is right by fully controlled pedestrian crossings [with Beg buttons needed to use, I admit]. So that the crossing of Greenlane and Great south Roads is done relatively safely than anywhere else nearby. What do you expect? AT has the 007 bus pull up right outside the station stopping in the lanes right by the round about – leaving the users to somehow manage to get across the road or forcing them to do a huge detour back to the lights to cross and then walk back? Properly the station and the surrounds should be linked by walkable links, but that whole area has been a real mess for cyclists and walkers for years – ever since the motorway went in at least. Hardly fair to blame AT as the last man standing for a nasty traffic situation created by the old MoT and/or MoW decades ago. And reinforced by the Auckland City Council with their endless improvements ever since that have only made it worse. That pedestrian link over the motorway was a sop to the notion of token walkability even back when it was put in, its clearly showing its age and use by date now. Greg N, yes you’re right that the transport agencies and council of the past have left us a right mess. But I think the point is that walkability around Greenlane Station is awful, and it’s AT’s job now to do something about it. A good place to start would be extra northern and southern exits. A pedestrian route would go up in a lift from the very northern end of the platform (on the north side of the overbridge) and over the track to exit between the Carfe and the greengrocer’s. This instantly improves the station accessibility of the residential area including the big new development on Marewa Road, and if a decent bus stop could be built (in front of the Wash Depot?) improves bus-train changing amenity. On the south side, a bridge could go up and over the track and the car sales yard into Derry St, and ideally also another exit over the track onto Adam St, as used to exist years ago. Continuing further, getting down onto Mitchelson St would be tricky, but likely possible with stairs. 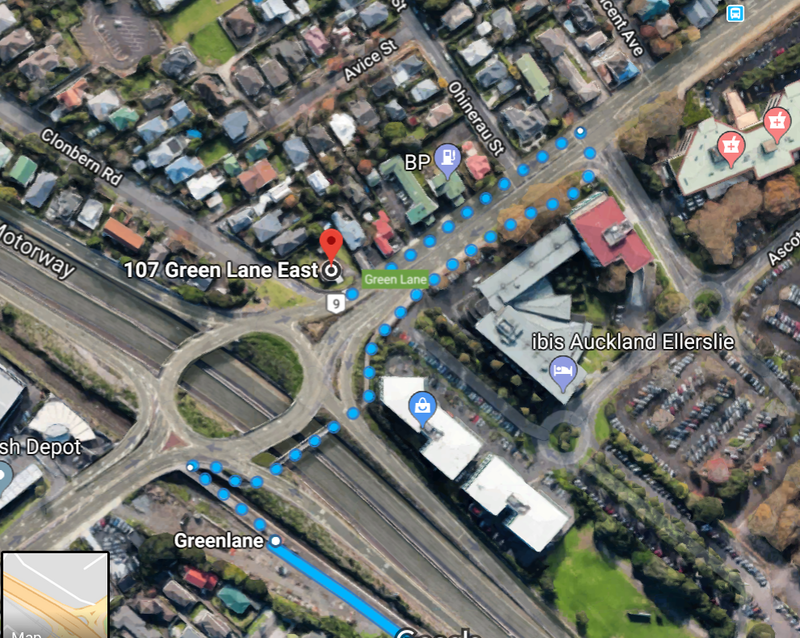 I am aware of a proposal for a walking and cycling path alongside the railway from Newmarket to Ellerslie or so, but why should station access wait for longer-distance initiatives? Apparently the local boards (Greenland Station is on the boundary of Orakei and Albert-Eden LB areas) are aware of the issue, but as usual, they are so underfunded not much can happen now. Time for central government help? Greg, AT did indeed inherit the problem of a poorly walkable city, eight years ago. Since then, the pedestrian death and serious injury rate has gone up by 44%, probably mainly due in some way or other to the induced traffic from road building. AT is still road building, still inducing traffic; still using that money for roads instead of fixing the dangers to pedestrians. No point not pointing this out. Yes, it’ll take some lateral thinking at this location. So thanks, Glen, for those suggestions. 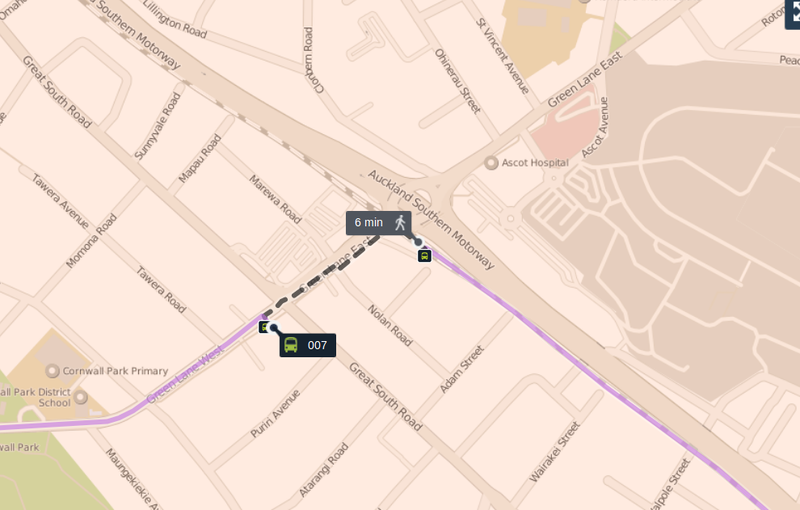 Yes Southern Line to 007 transfers are hopeless.. the northbound (eastbound?) 007 connection is worse. The bus stop itself is the most miserable place. I agree, Greenlane station access could be so much better. Is there sufficient room between the tracks to extend the platform under the bridge through to the northern side of Greenlane Rd? From memory the tracks are pretty close together by the time the train exits from under the bridge (heading north). Would it be possible to slew the tracks apart for long enough to provide this access? And a connection to Derry St and/or Adam St should be relatively easy. “real” airports have invested in heavy rail – and normally it is very expensive. For example the Heathrow Express is $48 one way! Not really a good example – there are other heavy-rail options for Heathrow (Heathrow Connect, Piccadilly line, soon TfL Rail then Elizabeth line) that are a lot cheaper than Heathrow Express. But although the Piccadilly line is heavy rail, it is actually similar in concept to our light rail option – a suburban rail line that also happens to connect to the airport. When you spend a few billion on 20 stops you need much less fare/subsidy per passenger than if you spend a few billion on 2 stops. Nothing like our light rail and I don’t know why you keep pushing this. The only thing “light” about the Piccadilly line is the rather tight confines inside it (which is nothing to aspire to). It is a heavy rail train, operating on a heavy rail network, in a dedicated tunnel for much of it’s length and on grade separated dedicated tracks for the rest. ” Piccadilly line . . . .similar in concept to our light rail option “?? There is a major difference. The Piccadilly Line runs on its own exclusive corridor, either in tunnel or else fully-fenced. It does not share the street with general traffic and pedestrians. This is the distinction that proponents of street-based LRT for so-called “Rapid Transit” seem to have trouble appreciating. This is the issue that is likely to invalidate the projected timings for the likes of Dominion Road LRT. Not all of Dominion Road will permit the kind of sleek and unhindered operation portrayed in the image above. I think you miss Jimbo’s point. It’s not that the Piccadilly Line is LRT but that it’s a line that not only serves the airport but other catchments too. Also that link is BS because that’s not what Dominion Rd will look like post LRT, it will be more like what we can see on the Gold Coast, kerb separated corridor with a lane either side to keep cars out. 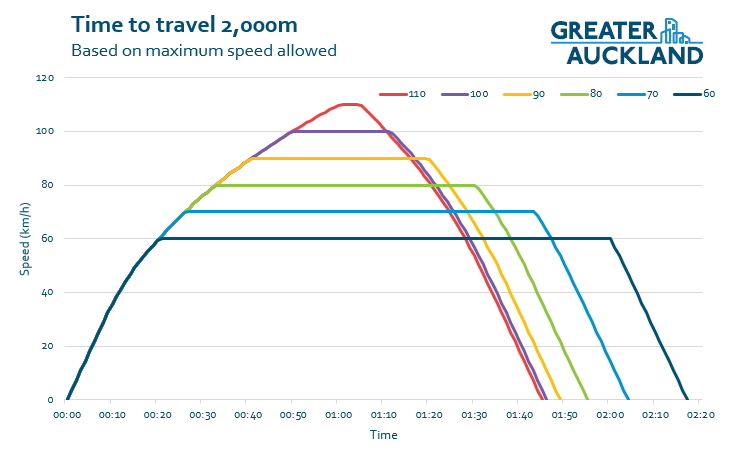 So key thing is that Gold Coast corridor section example from Matt at least 50km/hr or 30? Hi Matt, yes I see what Jimbo is getting at. I’m not sure though that I agree with his rationale that more stops proportionately equates to more passengers. As regards the comparison between Gold Coast’s Queen Street and Auckland’s Dominion Road, the former has a kerb-kerb width of about 17m at the point your google-photo is taken. Much of Dominion Road is 14m, with narrower footpaths, no berms and much closer proximity of dwellings to roadway. Be optimistic if you like, but when I see the mounting pressure for 30Km/h zones on Dominion Road-type environments in Wellington, I think we need to prepare ourselves for lower LRT speeds than 50Km/h in such situations. Dave – I can’t see what your concern is with that image of Dominion Rd you linked to. On each side of the road is a faded bus lane that is being used to store cars. This would be transferred to the middle while the vehicle lanes would go to the left, the only people who lose are those who like to store their cars on Dominion Rd. @Dave – maybe some parts of Dominion Rd may need a slight narrowing of general traffic, LRT lanes or path if necessary but 3.3m times 4 lanes would be 13.2m, well within 14m & I get about 16.5 measuring that Gold Coast Rd which also has painted on cycle lanes on both sides. Jezza, Grant, Matt, Auckland Transport – perhaps you are all right. Perhaps Dom Road can be transformed into an environment where 66m, 100-Tonne LRVs can safely barrel along at 50Km/h with pedestrians able to cross in front of them. Perhaps I am too blinkered by the heavy hand of “Zero Harm” I see applied to heavy rail, and also the kind of speed restrictions I have observed on other on-street LRT operations (most recently Manchester Metrolink between Piccadilly and Victoria, which crawled along). But I simply warn, be prepared for a greater level of speed-regulation than what you see with ordinary road transport (which we all know is way too lax). Dominion Road currently has cars, buses and 53 tonne trucks doing 50kmh (well 60) four inches away from footpath. Putting the PT in the median between those lanes is hardly making things worse. Nick R: that may be a common-sense view, but it doesn’t reflect the legalities of rail versus road operation (as I understand them, anyway). Rail operators have to be licensed, with an approved safety case, and any breaches must be notified to the relevant authorities. The safety obligations of a rail operator are significantly greater than those of any road operator, so rail operations are much more highly regulated and hence risk averse. – every incident of a train passing a signal at red is investigated (not sure how that would be applied to traffic lights). – speed limits are precisely what they say: there is no tolerance. In summary, we as a society accept the risks of (unguided) trucks travelling illegally at 60km/h four inches from the footpath; we do not accept the risks of anything mixing with (guided) trains at any speed (except for low-speed trams). How that pans out for light rail will be very interesting to see. We’re not unique in terms of stringent safety requirements in the Western world. Light rail systems operate perfectly fine in other places with as tough if not tougher safety requirements. jezza: indeed so, but the comparison was being made with road vehicles, not with how other regimes regulate light rail. It seems fairly common (and fairly absurd) that the inherently safest means of land transport is subject to much greater regulation than the inherently most dangerous. My view is that that’s largely because railways are easier to regulate and don’t have many votes or shout loudly, but should those be good reasons for tolerating risk levels many times higher than they could be? IMO the easiest way to judge the usefulness of a city’s transport network is to count the total number of stops on frequent rapid transit lines. Of course there are a number of other factors, but in general this will give you an idea of how many people have access to good PT. Light rail will add 20 new stops to the network, heavy rail will via Puhinui only add 2 (if that spur is indeed frequent). So in my opinion light rail is 10 times better than heavy rail. Forget your fancy business cases, naysayers, duration to the airport, etc; light rail easily wins. Too many stops does not equal good PT, it just means slow PT. If you ask people what their biggest issue is with Auckland PT, it’s not the number of stops, it’s the amount of time it takes to get anywhere. Especially compared with using a car. Yeah obviously it’s important to get the balance between speed and convenience right with stop spacing, but that’s not the point. LR massively increases the catchment of our rapid transit network. HR via Puhinui does not. But compare the CFN map including light rail to the existing Auckland rail map with a little spur off the bottom of the southern line – I sure know which one is the better system. Matt, So you allowed theoretical future network improvements on the HR line in the calculations as well, can u expand on that? We’re they just guesstimates between each station? (I didn’t check the charts properly as I’m on my phone). I assumed that dwell times would improve to be 30 seconds at most stations and also reduced the mulitiplier factor by 5% to account for network/operating improvements i.e. line speed speed tweaks, infill balises etc. Thanks. I think you have flipped your LRT distance & time figures of the 2nd two stops. This is nice work, well done. A few minor debatable factors mostly cancel out. 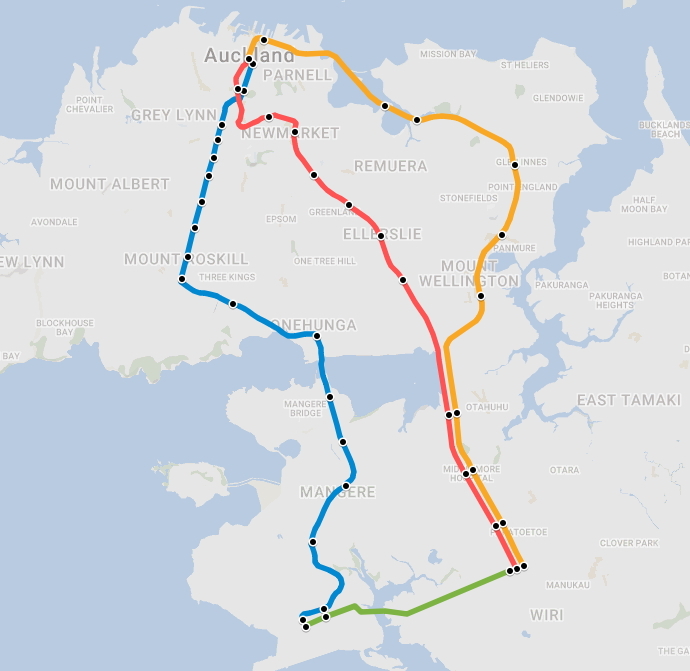 I would like to see route tables for the full hypothetical Aotea to Airport routes similar to the ones you have produced for the existing lines. A graphical representation of the competing proposed routes would explain this quite well to a lot of interested people who lack either the technical skill or the will to understand. It would be also interesting to note the affect of removing level crossings on the western line for instance. The difference between 80-90kph top speed might not be much, but getting rid of the 50kph restrictions would make a huge difference. You can estimate it relatively easily with the info above and current timetables. Aotea to Penrose is about 19 minutes (similar if going via Grafton or Parnell). That leaves just Penrose to Onehunga. Currently scheduled at 6 minutes. Nice work Matt. If the LRT is something like a Citadis X05 I think you will find the maximum service speed is 80 km/hr not 90 km/hr. However they are also faster accelerating and, for the reasons you well explained in the previous post, the difference this will make would only be a few seconds. Plus I suspect they could beat the 30 second dwell time on the smaller stops. So I think 42 minutes to the Airport looks pretty right. What I find more interesting are the intermediate times. On these figures someone in Mt Roskill could get to Britomart in 17 minutes, or from Mangere to Civic in 31 minutes. Playing with Google Maps that is a 10+ minute improvement in PT accessibility compared to current buses and trains, with a better frequency and reliability too. This benefits a lot of people, and underpinns the sort of benefits used to justify the RTN. Off topic comment – Is anybody thinking about purchasing an AT swipe keyring? Key thing about LRT to the Airport would be traffic priority. For instance, according to your estimations, it’s only 5mins now from Britomart to K Road (including dwell times). That’s quite optimistic, and in the real-world sense, only do-able if Light Rail is fully segregated from all other traffic along its route. Even Melbourne’s trams in the CBD area can’t do half that speed due to nearby pedestrians, traffic lights, stops bursting with people, etc. But the light rail is proposed to be segregated. With traffic priority at signals modern LRTs can be much quicker than Melbourne trams, which are slow. Their system average speed is 16 km/hr. Gold Coast LRT (before the new extension) averaged 22-23 km/hr speed. Modern French and German systems are similar. And that is all in 50-60 km/hr traffic. On a segregated run to the airport speeds could be much higher. Lyon Line 4 to the airport is a relevant example, and it averages 40 km/hr+. The Onehunga Mangere Bridge section will not be 90 km/hr. The section into Onehunga along Princes St will also not be 90 km/hr. Second, you missed a potential stop at the Onehunga Port. Although if the Airport line is a thru route to Manukau you can cover that by dropping the Airport BD stop. What’s the RRR travel time to the airport from Hamilton/Tuaranga via Puhinui? Hamilton to the Airport with RRR stage 2 would be about 1:30 and Tauranga to the Airport would be 2:22. That is allowing an average wait of 5 minutes for a bus at Puhinui. Those times would be reduced by 19 minutes with RRR stage 3. Presumably the Puhinui busway will also go to Manukau. What happens to the 380 will it still run. The run down Lambie drive would still need a bus route even if it doesn”t go to the airport. Neat, map showing the blue, red and yellow line options. Onehunga line, continue HR over the blue line from Onehunga to Airport then calculate the times. Then in future the option for an airport limited stops. Also why does the HR red line not go direct from Newmarket to Britomart? Your light rail times are based on a flawless operation with no delays. But delays are inherent to any PT operation, and are therefore built into timetables. You have compared train times with built-in delays, to light rail times with no delays. The dwell times are also overly optimistic, and you haven’t included the fact that the LRVs will stop at red lights, and will need to slow for pedestrians and cars at many locations, unless you back the idea of fully fencing off the LR corridor along Dominion Rd so that pedestrians crossing the street are never on the right of way. And no, they won’t always have green lights at intersections. Phase priority doesn’t work like that. The Gold Coast LR is 13km long, the same as Britomart to Onehunga via Dominion Rd, and it travels at a good clip of 50 and 70, with 30 through town centres. It takes 39 minutes. But the Auckland example as you point out, will have a lengthy 30 zone at the start, so to get to Onehunga is going to take longer than 39 minutes. Likely about 43. The Airport therefore isn’t going to be 45 as you claim (actually AT claim 43, not 45). You also assume LRVs will travel at 90km/h. That is a complete unknown, as the design of LRVs will determine speed (higher-speed trams need bigger wheels, and raised floors), and even if 90 is authorised, it will not likely be reached in normal service, just as trains don’t generally reach their maximum speed. You have previously claimed train times for the EMUs that have been vastly overstated, just as AT did. They were supposed to be 10 minutes faster, but are actually 5 minutes slower. A massive 15 minute difference between what was claimed, and what was delivered. Now you are doing the same with trams. Are you doing this knowlingly, or out of ignorance? There’s not a single true claim in your comment. 3. LRT is intended to have full signal priority. There may be some where they have to slow a bit but that’s built in as per 1. 4. Gold Coast is 19.5km long and takes 45 minutes end to end (as per timetable). Much more of its running is on street than in Auckland were from Civic to SH20 is only 7.1km. From civic the 30km section is only about 1km. 6. If I plug in Gold Coast station spacing and what I assume are the speed limits, I even get the same travel time as the timetable says. 8. Yes we’ve claimed that EMU times are overstated and still do. A lot of that has to do with our excessive dwell times however in the post I’ve done a version of HR with lower dwell times and reduced the buffer factor. That’s what I’m comparing LRT to. A few commenters above seem to be goading those who advocate airport HR to counter the time-estimates produced by Matt. 1. The Heavy Rail we currently have is deliberately made to under-perform in terms of journey-time because of the contractual incentivisation of punctuality. Timetables are deliberately padded out to try and minimise late-running. The timing currently allowed from Britomart to Papakura is 51 minutes. Modelling based on the same sort of calculations Matt has done show that an unhindered run with all stops and current dwell-times could be done comfortably in 45 minutes. 2. Further padding is introduced where routes merge at flat junctions, and where passenger and freight must mix. There are places where trains either run deliberately slowly or else arrive early and have to wait around because of timetabling compromises. 3. The acceleration capability of the CAF units is deliberately capped at 1.0m/s² for reasons of “passenger comfort”. I do not know what these units would be capable of without this cap but I would be very surprised if they couldn’t manage the 1.3m/s² that Matt cites for certain LRVs above. It makes no sense to me that heavy rail passengers are deemed to need this ‘comfort factor’ while light rail (and bus) passengers are not. 4. The excessive heavy-rail dwell-times we all know about, but the reason for these stem from decisions made in specifying the equipment. Dwell-times on Wellington’s HR trains can be as low as 15 seconds! Anyway my point is that the heavy rail we currently have is performance-constrained largely by policy. Some of this is for good reason, and some (in my view) is certainly not. But what we don’t know is, what kind of policy regime is light rail going to find itself subject to, particularly where it will be interfacing with traffic and pedestrians in the street. I believe this is where the idealistic calculations of journey-times may well come unstuck, just as they have for our heavy rail units or possibly even moreso given the unpredictability of an un-barriered right of way in the public street. None of this is to say LRT shouldn’t happen or won’t work. But the comparison with what heavy rail can (or should) offer needs to be made fairly if it is to be made at all, and the assumption that LRT will have free-rein to perform without hindrance needs to be reality-checked. How can you claim the timetable is padded out when the trains quite often run a little bit behind schedule? Earwigs in the signal box at Didcot. Can someone explain why LRT is planned to follow Dominion Rd, rather than Manukau Rd? The latter is 1.5km shorter and, in clear traffic, Google maps says it takes a minute less to drive. It’s meant to replace buses on Dom Rd. 1. It’s a longer stretch of 50kmh running from Queen St to Onehunga than the Dominion Rd option. 2. You would need to figure out how to manage high frequency LRVs and buses through Newmarket without causing delays to both. The Dominion Rd route has no clashes with buses. Also Dominion Rd more catchment now and in future? Currently more buses along Dominion Rd than Manukau anyway I would of thought. Because the primary function of the light rail line is to solve Dominion Rd bus congestion. The airport is an add-on that goes sideways across the isthmus to get to Onehunga so that it’s in the right area for serving the airport and Mangere. Something the existing Onehunga Branch is already positioned for. It’s a bizzare plan that tries to join two completely separate needs (CBD-Mt Roskill bus de-congestion, and Airport-Onehunga mass transit) into a single project, which is essentially the product of very poor planning and will deliver very poor outcomes. Especially for whoever funds it, as it dawns on them they will not receive their financial return because they were lied to about the benefits and likely success. And I guarantee you the projected 43 minutes will be 60 minutes by the time it opens. The first time revision from 43 to 45 minutes has already happened. Look out for 47, 49, 55…. Auckland’s network has always been a mix of freight and low volume passenger. We threw $500m at double tracking out west, and for a bit here and there. (probably about the cost of double tracking the West line at the time). Then threw about $500m at the wires, and there has been top ups from the govt, plus access fees from AT. The rail network needs substantial further investment just to run the timetable we currently have…. But wait, we want to bring in another timetable soon. Giving less time for staff to access track for work, less opportunities for kiwirail to keep freight off the roads… Now we are at a stand still in the Britomart TUNNEL. I wonder how long it will take to lift and place three emu carriages inside there….. Hmmmm sounds like it’s due to a network fault to me….. Hmmmm sounds like MORE bad planning in my book. Why have you excluded the travel times to the Onehunga branch line? My understanding is that it currently takes 22 mins to go from Britomart station to Onehunga station according to the AT website. Assuming holding trams to cross over at the same time as a tram is at the station (Onehunga) this would allow another 13:11 to get to the airport on the tram which would give a total journey time of between 35-40 minutes to the airport which is a hell of a lot faster than wasting your time on Dominion Rd in the tram. There is a comment about it above. He also been using Aotea/Civic station for the LRT/HR comparison. Onehunga only has 2 per hour at the moment. Could maybe do 3 per hour with the CRL and would need double tracking to get high frequency. LRT will be running at 5min freq. So not a straight comparison. It is worth considering given very slow rail journey down Dominion Rd surely? Double tracking is an over-kill for three trains an hour? Sorry, I meant to go more than 3 per hour you’d need double tracking. Basically at the moment there and back again is 12min. Adding a dwell at Onehunga. So 20 mins. If you put a double section station at say Te Papapa you could increase frequency. Although that depends on the rest of the network. The 22 mins is with the Onehunga services running express. This would not be possible if if we were running 6tph through Onehunga if it were part of the airport line. The extra stops add 3-4 mins. In addition Aotea will become the central station post CRL, so add a couple of minutes for that and voila you have a pretty similar travel time on both routes. Just a question. Why not build a HR link from Purunui to AIA and then on to Onehunga. Then HR can run in a big circle in each direction via the CRL. Build the light rail up Dominion road and connect to Onehunga. Seems this would create optimal connectivity options. 1. Requires another crossing at Mangere. No chance for using the old bridge. 2. Adds no value to the network other than single seat trip to CBD. 1. So what build a bridge for dual track HR? LR will not magically float over the water either. 2. This would allow HR trains to run CBD to airport via Puhinui and back to CBD via Onehunga (and also the reverse direction). Thus providing increased capacity by effectively removing a branch line. Or possibly run it further south and link into the other end of Manukau so that this line is also no longer a branch. -3rd or Quad track on sections on the Sth Line will needed anyway as admitted in some of those tweets. I also assume Onehunga duplication will be required too as demand around the line increases. – Now you not only have ability to run CBD-AIA express in peaks but also run a variety of other patterns if required. From a scheduling point of view you have removed up to 2x branch lines and can therefore run trains continuously which is far more efficient. -Keep the Dominion Rd light rail for the higher denisty inner city area, but terminate it at Onehunga. Change for airport train would still be seamless. You could potentially also split the trams East/West at the end of Dominion road so every second one goes to (say) New Lynn. I can’t see why this would be needed. There is unlikely to ever be demand from the airport to justify any more than 6tph so there is really no need for a loop to allow for greater throughput. The existing and future populations out south are going to put much more demand on the system than the airport ever will, tying up CRL slots for excessive airport services will reduce our abilities to serve these areas. Well in the same way that nobody saw the need for the harbour bridge to have any more than two lanes each way! How would this config tie up CRL? It would free capacity on the CRL because you no longer need to have trains just for Onehunga Line or potentially Eastern Line, as these trains would just circulate in a loop. If the network expanded South you could run trains to city via southern or eastern line because the network capacity would now be there. Branch lines are killers of frequency on public transport networks where they have to share a common track at some point. The other point I would raise is maybe the answer long term is actually a dedicated standalone (driverless) metro (mix of underground and above grade where appropriate) from airport via city to North Shore/Albany. Still have LR in the inner city, but dedicated metro would be a clean/fast solution and also address the North of the city ignored by other options. I can’t see how you would make this fit into the running pattern proposed for network in 2045 without compromising service to other places. Plenty of people saw the need for the Harbour Bridge to be wider, it was cost restrictions. The design for light rail heading north from the Airport and a busway heading east has been based on known forecasts for passenger numbers to double at the airport. Even if this happened there would be no need for more than 6tph HR at peak. A competently managed urban rail service should have an off-peak minor station dwell of no more than 20 to 25 seconds. For example, this is common in Sydney: train stops, wait 1 second, door opening 4 seconds, handling passengers 10 to 15 seconds, door closing 4 seconds, wait 3 seconds, train starts. Total 22 to 27 seconds. This is with two person crews and large plug doors with 1.8metre opening. Is it right to assume a 50 kmph travel time at peak on Dominion Rd when it is not Grade Separated? What about traffic lights, what about morons that block trams getting on and off road like they do in Melbourne. I think realistic travel time (Airport to Britomart 45-50 minutes at peak. Please challenge me if I have missed something here? I think Dominion Rd section needs grade separation budgeted, given the plans are not being shared should this be raised for project viability especially concerning the airport link? Fixation on the “travel time from the CBD to Airport” is not the target market for the City-Mangere-Airport LRT. The target is commuters and ad-hoc trips. This is actually what we should be focusing on. 1. Dominion Road is at capacity with buses at the moment. LRT provides an increase. 2. Mangere does not have rapid transit at the moment. LRT provides this. 3. Commuters want fixed travel times. LRT provides this, even better than buses. 4. Ad-hoc trips require the connection. LRT provides a new network with connectivity to the old network. I think the above cases are also clear for the NW LRT route. Bravo, Nicholas. Possibly your best post ever. Yes, times will blow out for sure. If commuters want reliable transit times, then you want automated driverless metro, which will have lower cooperating costs than LR. Also far better optionality for extending it to the North Shore. There is an assumption with LR that the Onehunga to Airport section will have less stations and therefore higher speeds dragging the average up. However as it is a surface mode as density increases along the line there will be temptation to add more stations. Also in the CBD distance between some stops looks optimistic for a higher density area.